The healthcare sector is presenting new opportunities to investors. These are being driven by digitalisation, consumerism and the entry of non-traditional players, according to market players and observers. Abrar Mir, founder and managing partner of healthcare-focused private equity (PE) firm Quadria Capital, says the healthcare sector in Asia is benefiting the most from these trends. He points out that while investments in the sector are mainly undertaken in the West, the centre of gravity is rapidly shifting to the East. “The total healthcare spend in Asia is presently US$1.3 trillion. Our view is that it will reach US$4.3 trillion in the next 10 years. For context, that figure is larger than the current healthcare expenditure of the US and Europe combined. That is the opportunity driven by secular megatrends,” says Mir. The trends are not being driven by monetary factors that traditionally affect other sectors such as rising interest rates. Instead, they are driven by things like an ageing population, the affluence gap, lack of access and disease burden (impact of a health problem as measured by financial cost, mortality, morbidity or other indicators), which are irreversible in nature. 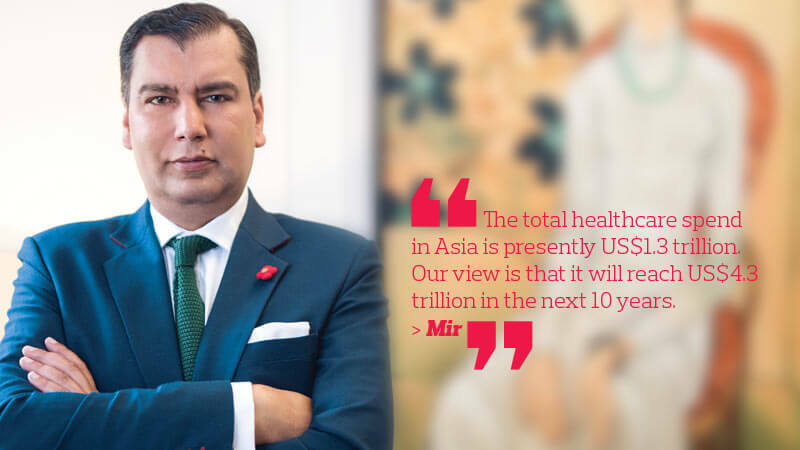 Vikram Kapur, partner at Bain & Co, says trends have always underpinned the demand for medical services, but the newer trends are contributing to the growth of the healthcare sector in Asia. “Demographics continue to be a strong trend pushing this growth, with the ageing population and increasing prevalence of chronic illnesses driving greater healthcare utilisation and demand for better healthcare and access to affordable care,” he adds. In short, the healthcare sector is ripe for disruption. Non-traditional players that have entered this space include Amazon.com Inc, Alibaba Group Holding Ltd, Tencent Holdings Ltd, Apple Inc and Samsung. According to Bain & Co’s Global Healthcare Private Equity and Corporate M&A Report 2018 published in April, Amazon roiled the healthcare markets early this year when it announced a partnership with JPMorgan Chase and Berkshire Hathaway to form a company to deliver healthcare to its employees. Amazon is reportedly planning to grow its medical supplies business to become a major vendor to US healthcare providers. Early this year, Apple announced the integration of electronic health records with its Health app, beginning with a pilot project involving 12 US medical institutions. Meanwhile, Samsung BioLogics has developed capabilities in pharmaceutical contract manufacturing. In China, Alibaba and Tencent have invested in tools that use artificial intelligence (AI) to aid diagnostics. Last year, Alibaba’s healthcare arm partnered three leading hospitals in China to launch its first AI medical laboratory, as the country’s ageing population looks to advanced technology to alleviate what has become an acute imbalance in the distribution of medical resources. According to news reports, this project includes setting up a public platform to support smart diagnostics and assist in clinical decisions. 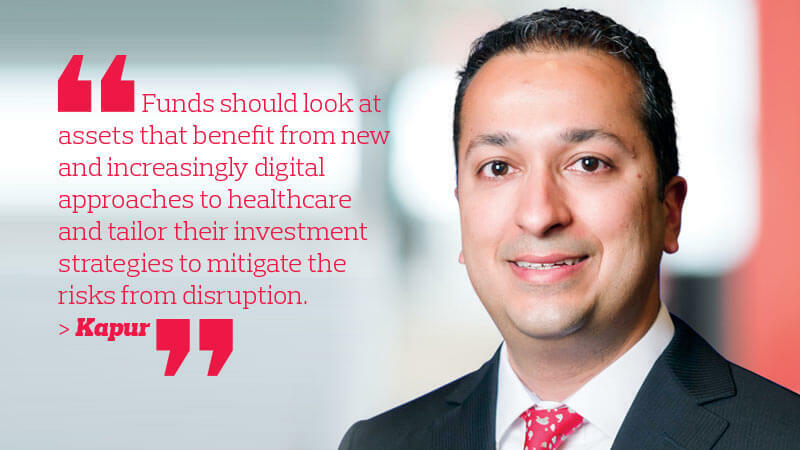 Kapur says funds evaluating current and potential healthcare investments should consider these players’ ability to use scale and technological expertise to challenge entrenched healthcare competitors while keeping in mind that the disruption will take a while to happen. “Funds should look at assets that benefit from new and increasingly digital approaches to healthcare and tailor their investment strategies to mitigate the risks from disruption,” he adds. While the healthcare sector seems to be delivering steady returns to investors, there are challenges. For one, the valuations are currently astronomical, says Mir. “Recently, our hospital group in Indonesia grew at a valuation of 70 times its earnings before interest, taxes, depreciation and amortisation (Ebitda). That is bigger, as a multiple, than Facebook and this is not a Facebook type of business. It is a doctor somewhere treating a patient,” he adds. Kapur says there is a combination of culprits driving up the sector’s valuations. These include the attractive margin profile, coupled with the large growth runway in many developing Asian markets, which caused a scarcity of investable assets of scale in an environment with large amounts of available dry powder, that is, an excess of cash reserves for investment. “Given the high valuations, funds need to develop and execute a clear go-to-market approach and plan to expand margins to capture the full potential of their assets and drive returns,” he adds. That is not to say there is no more value to be found in the sector. Dharmo Soejanto, senior director of multi-asset strategy at UOB Asset Management Ltd, says while certain areas may be frothy, there are sufficient sub-sectors that hold value. “For example, we think the larger medical technology companies are now cheaper in the smaller mid-cap space. Also, the market has not fully realised the potential of some of the biopharma players. So, there is still value,” he adds. While Soejanto thinks the current trends could lead to long-term structural growth, they have less impact on a year-on-year basis. Thus, equity funds that invest in healthcare generally put their money in companies that develop new drugs as they are more likely to deliver alpha returns in the shorter term, he says. “Over the last 12 months, we have seen a lot of activity in the medtech space. There are more companies involved in equipment and life sciences tools that are actually getting strong orders and presenting good revenue growth. Another area we think is interesting is small biopharma stocks. The impact of having a successful drug can be very significant for smaller companies,” says Soejanto. In terms of equities in general, the global healthcare sector has been delivering stable returns in recent years. The S&P 500 Health Care Index (comprising companies included in the S&P 500 that are classified as members of the Global Industry Classification Standard healthcare sector), for example, delivered annualised returns of 15.74%, 11.24% and 13.13% over the past one, three and five years respectively (as at Sept 24). Soejanto points out that while the returns in the healthcare industry can be high, so can the volatility. “We are seeing healthcare companies move 10% to 15% on a monthly basis. They can swing quite widely, depending on the outcome of their drug trials and US Food and Drug Administration approvals. That is why we have to make sure we are diversified enough and not have positions that are too big in these companies,” he adds. UOB’s United Global Healthcare Fund, which is sub-managed by Wellington Management Singapore Pte Ltd, is one of the unit trust funds investing in the healthcare space. According to its fund fact sheet as at Aug 31, the fund had delivered a return of 9.66% since its inception. “Our investment philosophy is that we believe you need people with a deep understanding of the industry to do well when investing in a sector. I think that is why the fund managers and analysts are the people who understand the science behind the drugs and medical technologies. They are the ones capable of being ahead of the trends,” says Soejanto. The fund’s allocations lean towards the US as it is one of the biggest markets in terms of what it considers investible companies, he says. The fund house also sees opportunities in countries like Ireland, Japan, the UK and China. The United Global Healthcare Fund has S$341.28 million under management. Its top five sector allocations are biotechnology (30.15%), pharmaceuticals (26.70%), healthcare equipment (16.64%), managed healthcare (9.43%) and life sciences tools and services (4.19%). “There are a lot of young, innovative companies that we are really bullish about. 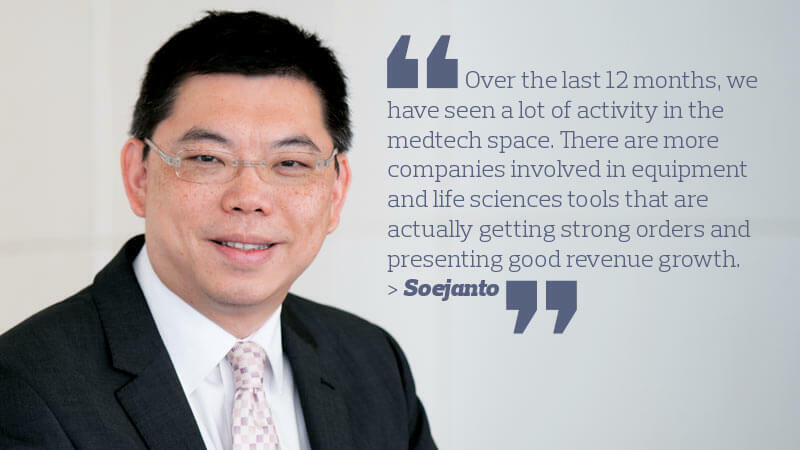 Conversely, what we want to avoid is the larger biopharma companies that have become less innovative or are starting to face issues such as the patent cliff,” says Soejanto. A patent cliff refers to the abrupt drop in revenue when a company’s patent expires as the products can be replicated and sold at a much cheaper price by competitors. “These companies will probably see it reflected in their revenues soon. So, the idea is to avoid these companies and go for those that are developing drugs with significant market potential,” says Soejanto. He adds that every investor should have a certain amount allocated to healthcare in their portfolio as part of a long-term structural growth strategy and natural hedge against rising healthcare costs. Although the safe-haven status of the sector may tempt them to make direct investments, he believes this is ill-advised. The industry is very complex. If an investor buys into the wrong companies, the drawdown and volatility can be quite substantial, says Soejanto. “You need to have a certain level of understanding of the industry to be confident that even if a drug trial does not go through, you won’t get spooked. You know that the technology and science behind it is solid. So, you are willing to hold or even add your allocation. Otherwise, you will be dragged around by news flows and market volatility,” he adds. Healthcare is one of the most popular sectors for impact investing for obvious reasons. According to the World Health Organisation (WHO), investments meeting the Sustainable Development Goals (SDG) Health Price Tag could prevent 97 million premature deaths and 20 million deaths from non-communicable diseases such as cardiovascular disease, diabetes and cancer. The SDG Health Price Tag is a model that estimates the financial investment needed to strengthen health systems to reach the health targets of the Sustainable Development Goals by 2030. However, reaching the health targets would require new investments increasing over time to US$371 billion annually, from an initial US$134 billion or US$58 per person. Thus, there has been a major push for more impact investment deals in the sector over the past few years. Citing Standard Chartered Private Bank’s Asia Sustainable Investing Review 2018, Eugenia Koh, head of impact investing and strategic engagements at StanChart, says healthcare is one of the top impact investment allocations in the region. She adds that 70% of these “value seekers” are making impact investments as they believe they will see returns that are on a par with their more mainstream investments. “For example, if they are getting a double-digit return in healthcare by investing traditionally, then they would want to get the same returns through impact investing, which is not impossible. Generally, however, individual investors are still confused about the concept of impact investing and how they can make a difference while still generating returns. 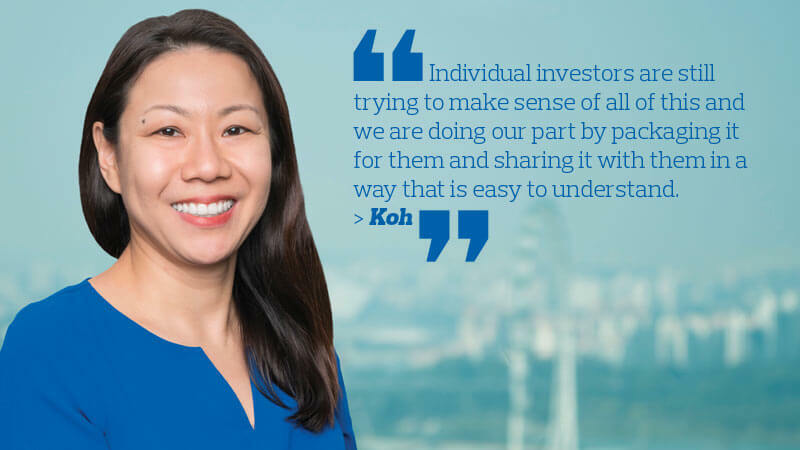 That is why the players need to play a bigger role in increasing the awareness of the need for impact investment in the healthcare space and what kind of returns investors can expect, says Koh. StanChart works with PE firm Bamboo Capital Partners to offer impact investing exposure to its ultra-high-net-worth clients. Bamboo’s PE funds have positions in impact investing ventures in various sectors, including healthcare companies in tier-2 and tier-3 cities in India and micro-finance institutions in Mexico and Colombia. There are a lot of reasons impact investment should be the way forward when it comes to investing in healthcare. Mir says more impact investments made by private investors are needed in this space to bring quality healthcare to people who need it the most. “To give context, we believe that Asia accounts for only 30% of the world’s population, but we are affected by 50% of the world’s diseases. Asia is overwhelmingly sicker. For instance, there are more cardiovascular patients in this region than anywhere else in the world. If you compounded that with the sad fact that almost two billion people in Asia are living on less than US$10 a day, you would realise how important affordable healthcare is. That is why we think private investors have a very important role to play in creating an environment that enables business models to actually deal with these problems,” he adds. Mir was speaking at a session on “Healthcare and Impact Investment” at the Asian Venture Philanthropy Network’s 6th annual conference in Singapore recently. There are four intractable issues in the healthcare space that impact investors can help with, he says. First is the lack of access — there are not enough doctors capable of fulfilling the demand for care. “According to WHO, the minimum number of doctors for 1,000 people should be seven. In Asia, there is only 0.5 per 1,000. In some geographies, it is even worse. Indonesia, for instance, only has 36 interventional cardiologists for a population of about 250 million with high cardiovascular disease risk,” says Mir. The second issue is affordability. About 2.5 billion people globally fall in the income bracket of US$8 to US$10 per day. This means that each year, thousands of people are just one serious illness away from financial catastrophe. The number one reason for personal bankruptcy in Asia is unforeseen medical costs, says Mir. “It is not because they bought a car and could not afford to pay for it. It is really as simple as one breadwinner being affected by an illness or an accident that takes away his livelihood. So, affordability is critical,” he adds. Next is the lack of awareness. Mir says the disease burden in Asia is not around communicable diseases such as tuberculosis, malaria or even dengue. Instead, they are serious chronic lifestyle diseases such as diabetes, cardiovascular diseases and cancer. “Lastly, the big issue from our perspective is quality. We do not want to compromise on that. There is no use building systems that treat healthcare but frankly, lack the quality actually required,” he says. To address these issues while still generating top quartile returns, Mir says the firm works on designing healthcare to better cater for today’s needs across all areas, from life sciences and pharmaceuticals to medical technology. “Here is an easy example — healthcare services for hospitals. When my mother gave birth to me, she was in hospital for four days. When my wife gave birth to our twins, she was admitted in the morning and discharged in the afternoon. That is how the churn has changed. Mir says at the PE firm, there is certainly the power of combining profit with purpose, so long as one is able to create an economic model that sustains, grows and builds. For example, Quadria Capital focuses on building large scalable businesses that can serve essential healthcare in a profitable manner — similar to how low-cost airline AirAsia is able to perform financially better than British Airways, which serves high-end consumers. “The largest hospital group in the world today is Hospital Corporation of America. Its typical Ebitda is 10% to 12%. Some of the best hospital groups in Europe are 15%. Our hospital groups in Asia are between 25% and 40%. That is a big difference,” he says.